Our Special Moments Event Planning dream makers love working with couples planning destination weddings. Working with the team at the Sandpearl Resort on Clearwater Beach is an added pleasure. 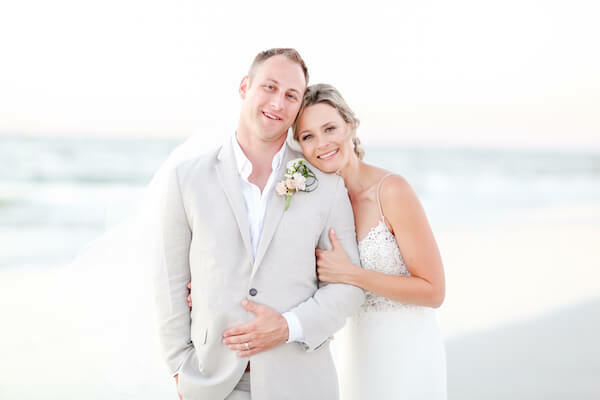 Anna and Andre were planning a destination wedding from Canada and they wanted their day to be filled with beautiful fun and personal details. The couple’s attire reflected the very relaxed and comfortable vibe they set for their family and friends. Andre looked very handsome in a lightweight off white suit with a white shirt and no tie. 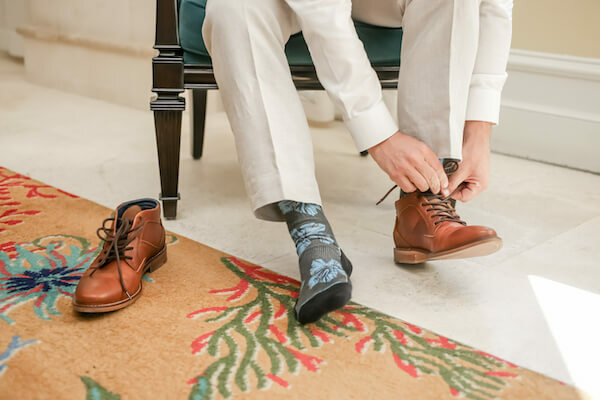 He added a little fun with these tropical blue hibiscus socks. 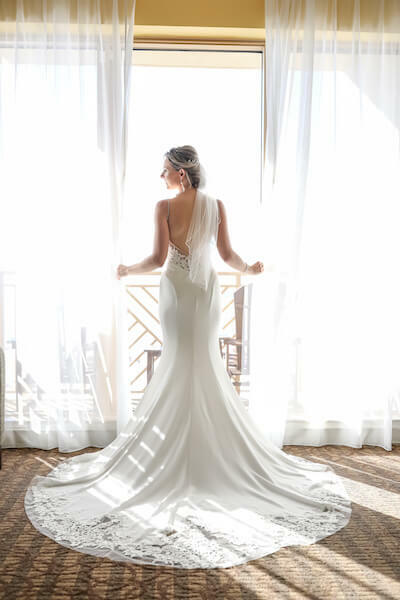 Anna was stunning in her lightweight gown with flowing train. The lace bodice has a plunging neckline and narrow crystal straps. 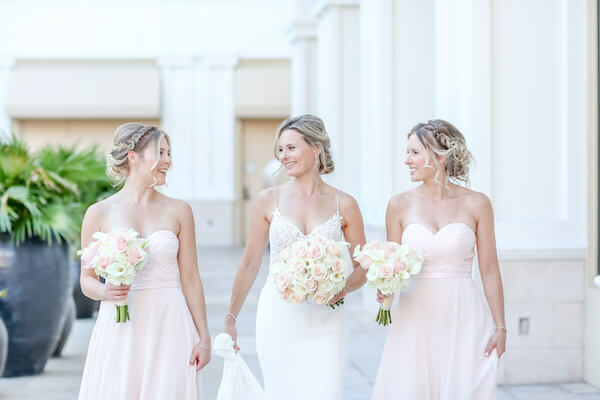 She carried a hand tied bouquet of white calla lilies, soft blush colored roses, and hydrangea that complemented the lightness of her gown. 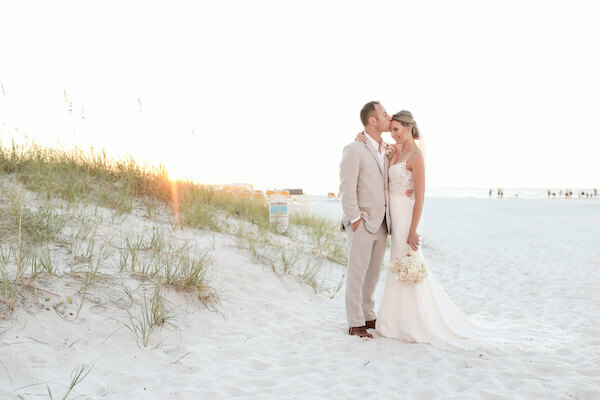 Following the ceremony, this very photogenetic couple took some time for some amazing photos on Clearwater Beach before heading to their wedding reception. 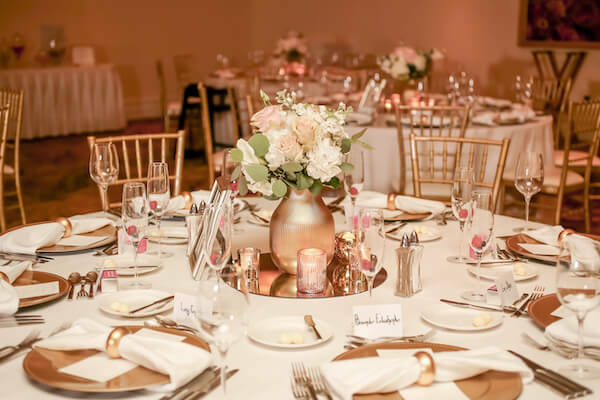 The wedding reception was designed using gold and blush, from gold chivari chairs, gold charger plates and gold napkin rings holding a simple napkin fold. 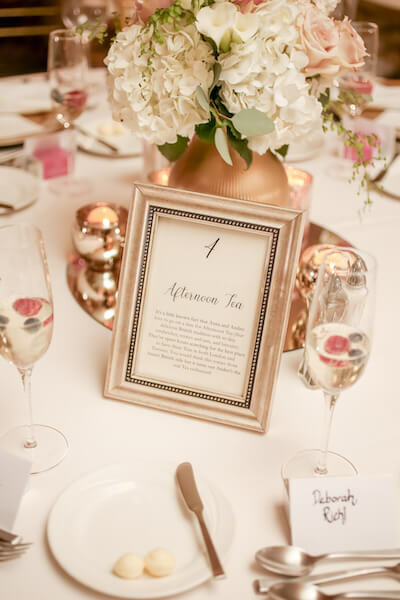 In the center of the table, a round mirror held a brushed gold vase with white hydrangea, pink roses and white stock with eucalyptus and was surrounded with shimmering votive candles. 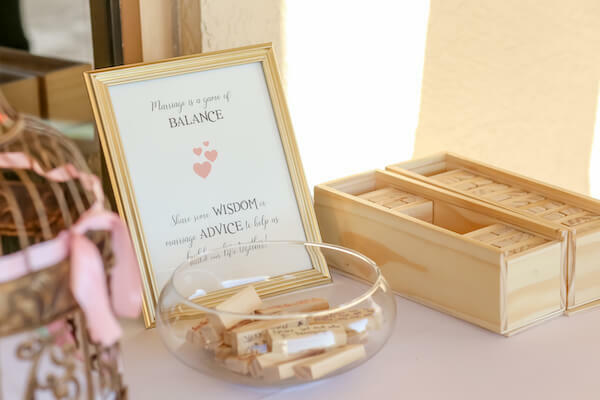 In place of a guest book guests were asked to share words of wisdom and advice on wooden Jenga pieces; something the couple is sure to have fun with in the future. 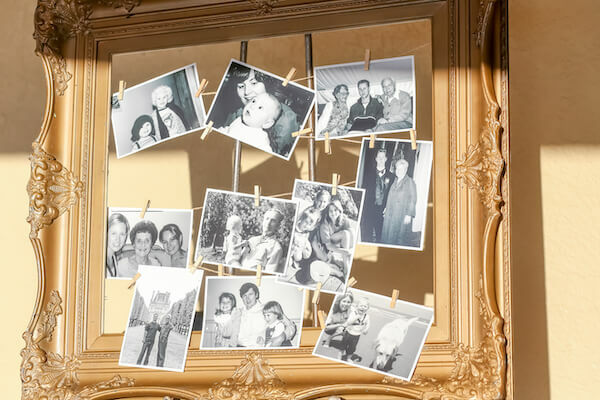 A vintage-inspired gold frame held a collection of family photos and each guest table was named for an experience that Anna and Andrea shared with guests seated at that table. The wedding reception was filled with toasts interspersed throughout the evening between each course of the dinner. 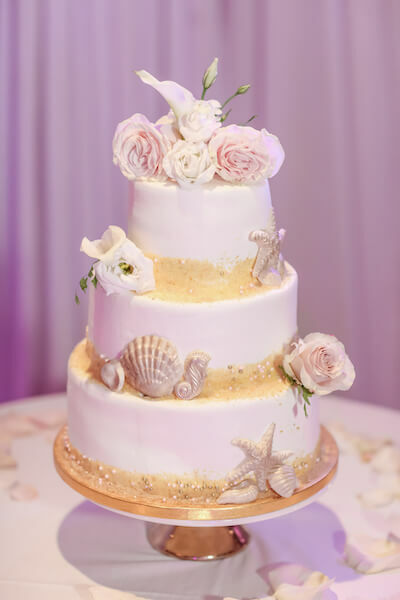 The evening wrapped up with this beautiful three-tiered beach inspired wedding cake with chocolate starfish, seahorses, and shells. 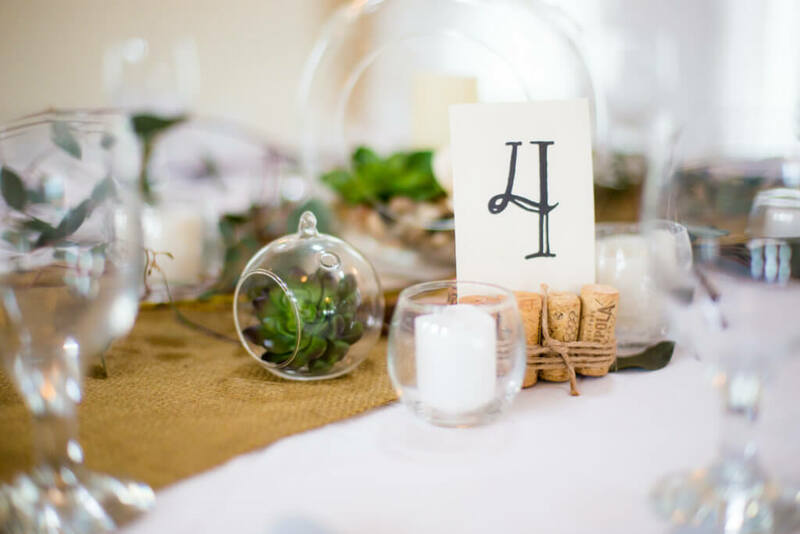 Thanks to all of the incredible vendors who set the stage for this amazing destination wedding.